Reading interviews with successful authors can offer hints to writing tactics. The number of options is paralyzing. Should I outline in advance or let the characters command the story? Edit as I go or write the first draft in one sweep? Write what I know, or write what I don’t know? Write a page a day, a page a week or whenever the muse moves me? Conflicting answers can daunt writers who struggle to find the right technique. Reading and writing about authors has shown me a wide breadth of approaches. I’ve had the opportunity to speak with three wonderful novelists—Jenna Blum, Alice Hoffman and Amor Towles—for my favorite section of The Writer, “How I Write.” Each author’s process is unique, and each approach has helped each writer to complete successful novels. When I read or write author interviews, I look closely at their writing process and compare it to my own. Towles wrote Rules of Civility with the methodical regiment of a mathematician, a process that worked well for the former investment executive. He carefully planned his outline then set a one year deadline to write 26 chapters, completing each chapter during short, weekly blocks of free time. Hoffman’s process is considerably more organic, while Blum uses outlines and rewrites each draft of her books from scratch. 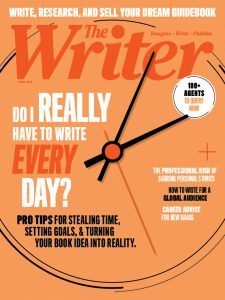 The authors I read about in The Writer magazine all have advice to offer writers. There is no one-size-fits-all approach to writing. But the one thing all authors can agree on is that it takes determination and commitment to write. While I’m still not sure what tactic is right for me, I know that I will need these two components to succeed. If you’re looking for a new writing tactic, read widely. Examine one writer’s approach and evaluate if that method could work for you. Be open to new ideas and give them a fair shot. You never know what might click.